In November, Petco was fined 1.2 million dollars in a class action settlement because of a Fair Credit Reporting Act violation, in which they didn’t properly disclose when they conducted background checks. With such a large company making such a mistake, it’s smart for recruiters and human resources professionals to check their own compliance with the FCRA. Here’s what we can learn from this costly mishap. Petco got in trouble because they didn’t include a standalone, clear and conspicuous disclosure. They included information about obtaining background checks in with the rest of their application and paperwork. Disclosing background checks isn’t a box you can check off and say that you’re complaint. Make sure that your applicants clearly understand your policy with a standalone disclosure, so that you’re all on the same page. So you found a great applicant, and then conducted a background check and found some not-so-great information. You have the right to not hire this person, but there are steps you have to take before doing so. You must give them a copy of the Summary of Rights and inform them that you may choose not to hire them because of the information you found in their background check. You also have to include a copy of the background report you received, along with information on the company that compiled the background report. You need to give this information to your applicant before you officially chose not to hire them, so that they have time to dispute any of the information in their background report. The rule of thumb for this time period between the pre-adverse action and the official adverse action is a minimum of five business days. A blanket policy to conduct background checks on all employees hired is not a violation. But you can run into trouble with the Civil Rights Act when you start manually picking and choosing who is screened. It’s illegal to conduct a background screening on someone because of their race, age, nation of origin, etc. It’s also risky to have a blanket statement on certain crimes that might affect some groups more than others. To avoid these risks, the EEOC Best Practice Guidance report recommends using the Green Factors when weighing certain convictions against an applicant’s ability to do a job. Some states have specific laws on background check compliance, or their own versions of the Fair Credit Reporting Act that impact the way employers are able to use particular information. For example, California has laws on some crimes that can’t be used against applicants, like certain marijuana convictions more than two years old. These laws can be tricky to navigate, but are crucial to remaining compliant. 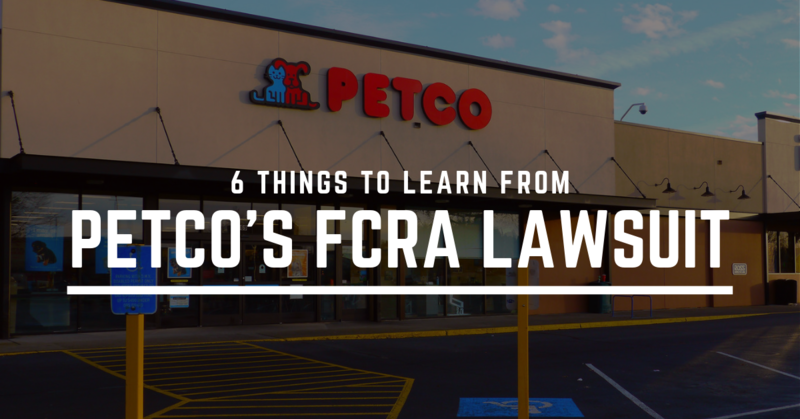 Petco certainly isn’t the only employer caught up in FCRA violations. In a similar case, Stanford University is currently facing a class action lawsuit for not obtaining clear permission for background checks from their applicants. According to the lawsuit, Stanford disclosed their background check policy on their standard application form. FCRA calls for written permission in a document that’s for obtaining permission for a background check, and the FCRA specifically says you can’t include these permissions in the job application. Again, background check permissions can’t simply be a box that applicants check. The safest option for your organization is to fully understand Ban the Box laws in your jurisdiction. They may mandate the point in the application process where you can inquire about a candidate’s criminal conviction history. As a smart employer, you know compliance is important. Failing to comply with changing regulations can result in costly (and preventable) class action lawsuits. As an FCRA compliant background screening company, Verified First’s in-house compliance team is dedicated to helping you stay up to date with the latest in compliance news.